The woods are quiet and the songbirds are nowhere to be seen. Although it’s known that wild creatures seek safe shelters and extra food supplies in anticipation of hurricanes, scientists don’t yet know how they can sense impending stress to the natural environment. Their ability may simply be the result of heightened sensory awareness through sight, hearing, smell and touch. 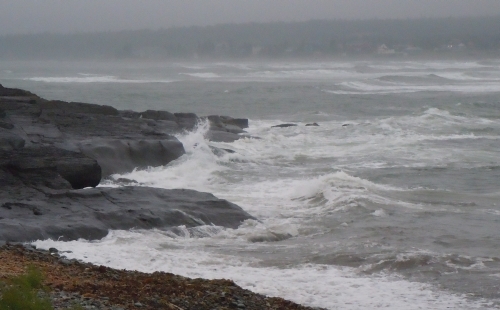 Along the shore, the surf is pounding the rocks relentlessly. 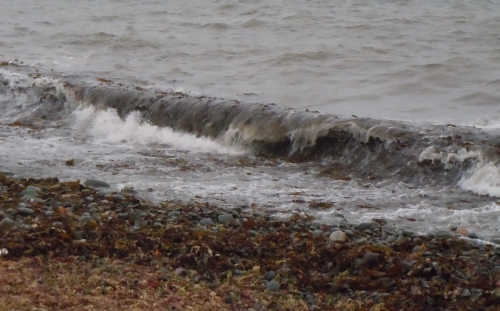 Waves are churning up seaweed from the depths. There are likely some crabs and urchins tangled in the kelp. Considering how quiet the woods are, I was surprised to see so many seagulls, sandpipers and cormorants hovering around the shore. They’re probably looking for one last meal before the storm arrives. Hopefully, they’ll all find safe shelter just in time. So you’re up early, too, Amy-Lynn. Here in northern Michigan, the wind beat on our old farmhouse all night long and continues as dark seeps away. Power was lost north of town (I know because my sister called me on her cell phone from a dark house in the woods), but we still have lights here to the south. It’s strange to think of Nova Scotia, such a northern place, having tropical storms. Is it a tide current that explains this? I hope you will all be okay today. 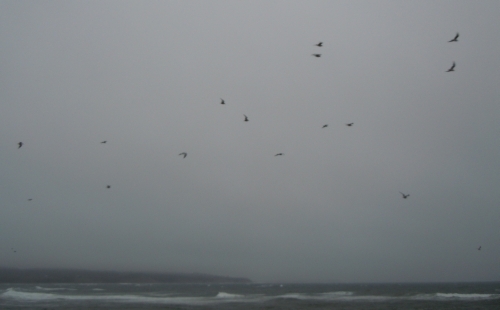 I suppose it’s illegitimate psychological projection to think of birds like gulls being “excited” by high winds, but I remember myself as a child before a storm, running and running like a mad thing, wild to climb trees and cling to the thrashing branches. What do you think? Pamela, it is odd to have tropical storms in Nova Scotia. The warmer ocean waters in our area are allowing hurricanes to retain their force as they move north. I made a quick trip out to Silver Sands beach this morning and was surprised at how many cars were in the small parking lot. This type of storm often attracts crowds of people to the shore, hoping to capture some of that emotional rush. We just got our power and Internet back. We also lost phone service from the evening onwards. It’s great to have everything back to normal again. Many trees and limbs came down in the yard but the house was fine. The blue jays and chickadees were out and about this morning. Some people think the storm was worse and some thought it was not as bad as expected. I think it depends a lot on how much damage you receive personally to your own property or if a loved one is hurt. One man did die trying to rescue his boat yesterday. I’m sure his family thought it was a horrific storm. I took Miss Sadie and the Cowboy down on the beach last night at dusk and they were wild with excitement. There’s something about being blown about that makes a creature–this one included–feel released. Of course, we were being blown about quite safely. The gulls behaved just as yours. Surely they know even better than the rest of us what’s out there, yet they wheel and call and fly backward. No accounting for gulls. Or people. I am irritated with us when we treat storms as spectator sports . . . yet I cannot resist a front row seat. Gerry, those waves are nothing compared to the ones that came later in the day at the height of the storm. Unlike *some* people, I am not a disaster tourist 😉 and stayed inside where it was safe. No there is no accounting for gulls, yet you’d think they’d know the sea and its winds better than much of the life on the planet, including us. Oh! you stayed indoors …pity. Thanks Amy, it was one great churning! Amy, I just got tears in my eyes worried about you up there in Nova Scotia. Hope you…and all the wildlife…will be safe as Earl blows through. We, like Pamela and Gerry, have been experiencing high winds since yesterday. We lost power three times (only briefly) and lost between 6-12 trees. They kept crashing in the woods around the house during the early evening, especially. The weather service issued gale warnings and really high seas–maybe 20-some feet–although I can hardly believe that. Wish we had time to go out to Point Abbaye and check what it’s like out there. Stay safe! And do post when you can to let us know. Kathy, I don’t live right on the shore or in a low-lying area so it’s pretty safe here when there’s a storm/hurricane blowing through. What surprised me most when I went outside were all the green leaves and branches on the lawn. We;re so accustomed to seeing colored leaves on the ground in the fall, never green ones. The trees are looking tired. They certainly were blown around. Lots of trees fell but some remained standing that I would have thought would have been the first to crack. There’s no accounting for inner strength from the outside. I read your post and thoroughly appreciated the very illustrative images. My gut reaction was one of fear. I have some, but little experience on both of Canada’s coasts and am fascinated by the ocean, but as much terrified by its power as mesmerized by its beauty. Then I read the comments and I was calmed. The quote in your reply to P.J. Grath is very profound. It almost makes me feel like those who are in tune with nature will allow her to blow though and will be cleansed, but not destroyed. I just looked at the Environment Canada forecasts and I see that Nova Scotia is not yet out of danger. I feel that you will come through this cleansed and not harmed. Cindy, the ocean fascinates me too. It’s constantly changing so there’s always something new to marvel at. The blowing wind is part of it. The sea breezes are so refreshing in the summer. It’s too bad it took hurricane strength winds to refresh the province after the heat wave we had this past week. 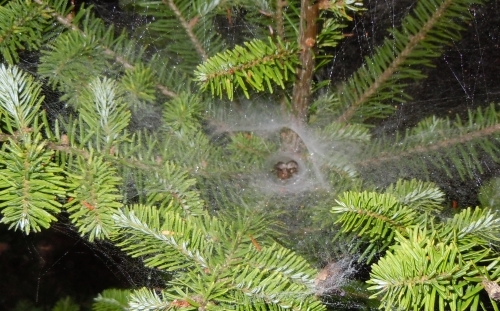 Insects, birds and other creatures are IN TUNE with the environment–unlike humans who think they’re NOT biological organisms part of an interconnected whole. No wonder ‘scientists’ don’t know how birds and other living things KNOW about dangerous weather conditions. 47whitebuffalo, the worst part of it is that we *think* we’re in tune when we haven’t the slightest clue. Being human, everything is about us and nature in all of its wonder is measured and tagged according to our standards and limited knowledge. Having lived on/near either an ocean or Lake Superior (With the exception of my years in Montana and it was the hardest part of getting used to live out there?!?!) – I am in love with water and it’s many ‘personalities.’ My soul is soothed by time spent near it! Cindy Lou, I think it’s water’s many changing personalities that make it seem so alive. Once you live near a large body of water it’s hard to imagine living anywhere else.